Her first week in California, author Donna LeClair scores employment in the household of Pauline and David Gram: an American media mogul, entrepreneur, philanthropist, and heir on Forbes list of the 400 wealthiest people in the world. Prior to her first day of employment, Brian, the Gram’s estate manager, interviewed her, valuing the fact she was a scrupulous, middle-aged woman, grounded in Midwestern roots. He believed her to be too naïve to differentiate cocaine from baby powder, but unwavering in allegiance to entrusted family secrets. A searing memoir as powerful as the life experience that inspired it, ‘Immunity’ shadows the rabbit trail as the author enters the realm of wealthy political notables whose privileges include protection or exemption from obligations and penalties, as David crows, simple peons shell out. Groomed, tailored and intellectually attuned to mint her role as Pauline’s personal assistant, she encounters the untouchable world of the elite. A path no man dare wander, least write about until declarations protecting honorably truth expose the consequences one’s life and actions there-of have on another. 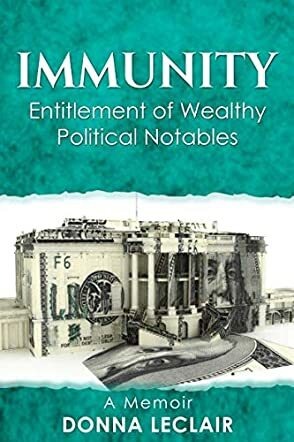 In Immunity: Entitlement of Wealthy Political Notables by Donna S LeClair, Emma Baker moved to Beverly Hills, California, and was able to get a job in the Gram household, with David and Pauline - American media mogul, entrepreneur, philanthropist, heir, and film producer on the Forbes' list of the 400 wealthiest people in the world. It seemed like a great job for anyone to have when they first get to Beverly Hills. Brian, the family's estate manager, interviewed Emma, thinking her naive and pulling her into the rabbit hole of wealth and power. I have never had any doubts that in the world of American politics and money the rich live in a very different world than the rest of us. I am sure not ALL of the wealthy are in that sort of circle, but a good many must be. This book only proved my thoughts. This is a dirty, no holds barred look behind that curtain of wealth and power, where people seem to get away with anything and everything. I wish I could say I was shocked by the events of this book, the things Emma went through and saw, but I really wasn't; it seems to be the scary world that we live in. What I can say is I am happy that a code of silence was broken and this book came to light. Author Donna S LeClair made sure to tell these true events in an engaging way that wasn't overly embellished either. The graphic parts of this book were not overdone, they were completely honest and that came through on the pages. This was a good and interesting read and I think it is something that everyone needs to read, even if it isn't pleasant.